The impact one life can have is truly incredible. You need look no further than Montana for evidence of that. Consider Charlie Russell. Who in his time could have predicted the extent of his legacy? A museum dedicated to his life and works? Schools and businesses named in his honor? An annual celebration of the Western lifestyle inspired solely by one cowboy artist? Russell is but one of thousands—maybe even millions—of Montanans to leave their mark on history. Some are just more famous than others. Sam Stephenson was born in 1868, the third of seven children on the family corn farm. He spent much of his boyhood digging out weeds and planting seeds, and setting up stalks that had been knocked over by the plow. In 1885, at the age of seventeen, Sam moved with his family to Ohio where he attended Miami University (in Oxford). At that time, it was uncommon for youth to attend college at all, let alone complete a six-year course in just five. Sam graduated in 1891 and put his knowledge of law to good use, going to work for Morey, Andrews & Morey in Hamilton, Ohio. Eight months later, he passed the Ohio Bar examination. At that same time, Sam’s brother George was operating a ranch in Raynesford, Montana. Sam had a romantic notion of the West, and—believing there to be great opportunities awaiting him—he spent all but his last fifteen dollars to get there. Sam was dead set on earning train fare back to Ohio, and for that he needed a job. He found work with his brother doing odds and ends, and haying for a nearby ranch. In time, he’d softened to Montana’s charms, and by the end of haying season, he’d completely changed his mind about returning home. Montana would be his home now. Deciding to stay, Sam found new work as George’s campaign manager. His brother had thrown his hat in the race for Cascade County Superintendent of Schools and needed help connecting with members of the local Republican Party. This brought Sam back to Great Falls, where he met with some the community’s more respectable members. In the end, George won the election but died shortly thereafter. Sam was appointed to finish the term in his place. In 1895, Sam passed the Montana Bar and went back into law. One of his early prosecution cases appeared in the Great Falls Tribune under the headline: “One of Mollie Thompson’s Girls Tried for Exhibiting Herself at the Park Theatre.” Evidence and testimony against the defendant was severely lacking; it was not a good day for the prosecution. Around 1909, Sam became an attorney for the First National Bank of Great Falls, an institution known for its ties to Marcus Daly and the Anaconda Copper Mining Company. Daly’s estate had been settled in 1902 by John G. Morony, future bank president and the man for whom Great Falls’ Morony Natatorium and Morony Dam are named. When Morony died in 1915, Sam was elected to succeed him. In a newsprint cartoon titled “Business Builders for a Greater Great Falls,” Sam was portrayed as a puppeteer (in good fun), pulling at the strings of the First National Bank, the Anaconda Copper Mining Company, the Milwaukee Railroad, and other notorious enterprises. Indeed, Sam’s influence in the community spread. As a lawyer, a banker, and a man about town, he became something of a local celebrity. Sam earned the attention of many in Great Falls, and in turn, many notable people earned his. On December 30, 1918, bar owner Billy Rance took down his Russell art collection and opened the Silver Dollar’s doors for the last time. At midnight, the distribution of alcohol would no longer be legal in Montana. (The Prohibitionists had seen to that.) As patrons drank away the last of Rance’s supply (which they accomplished by 9pm), Sam took interest in Rance’s Russells. He negotiated the purchase of fifteen paintings in cash—eleven oils at $1,000 each and four watercolors at $400 each. All eleven oils were displayed prominently in the First National Bank. The watercolors Sam took home. 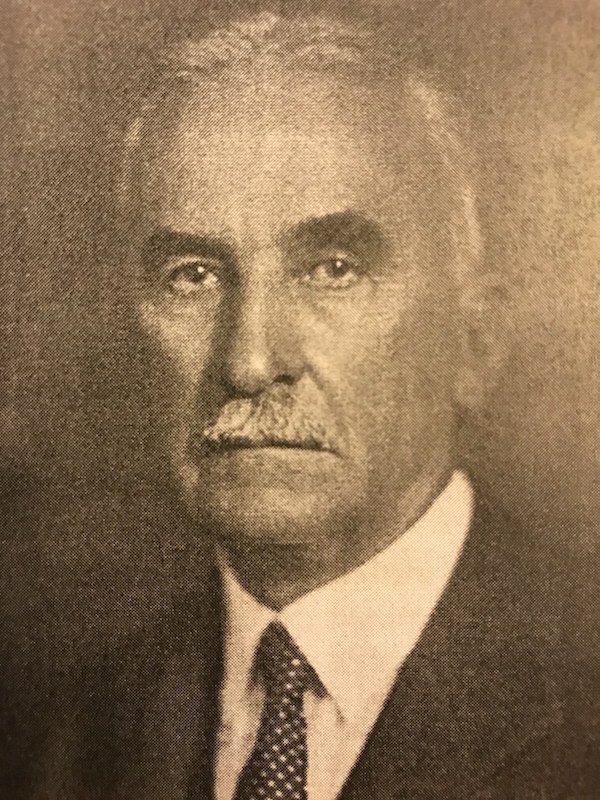 Sam served as bank president until 1934, the longest term of any bank president at that time. When he retired, he was succeeded by his friend and law partner, W.H. Hoover. In 1936, Hoover resigned the presidency to become western general counsel of the Anaconda Copper Mining Company. As a parting gift, the bank board offered him two choices: he could either have a cash bonus or take a Russell painting from the wall. Hoover was a smart man… he chose the Russell. And he was the last to get the chance. E.O. Jenkins was elected president after that and sold the remaining bulk of paintings to Phillip Gillette Cole, a renowned New York art collector, for $60,000. The collection was later sold to the Gilcrease Museum of Tulsa, Oklahoma. Only one painting was saved from First National Bank’s collection. Through some clever legal maneuvering, Buffalo Hunt No. 3 was gifted to the C.M. Russell Gallery (what is now the C.M. Russell Museum). Currently, three of the eleven oil paintings that Sam purchased from the Silver Dollar are on display there (including Hoover’s). Two of the four watercolors are on permanent display as well. The cabin was a substantial log structure on a rock foundation and with no fire place. Sam made several improvements to it while developing the acreage for ranching. Hoover followed suit, purchasing an adjacent homestead. By the late 1920s, they had acquired a total of 6,500 acres, a sizable property that included a cattle herd purchased from Elk Run, W.L. Velie’s ranch. (Velie was the president of Velie Motors Corporation in Illinois, and he was married to John Deere’s daughter.) Sam and Hoover named their outfit the Willow Creek Ranch after the waterway that flowed through it. In 1932, they paid $3,000 for one-half interest in Prince Domino the 9th, son of the prized Hereford bull Prince Domino. Three years later, they paid an additional $2,000 to bring Prince Domino the 9th home to sire the Willow Creek herd. The $5,000 acquisition was the highest price paid for a Montana bull at that time. A few years later, Sam died at the age of 73. Hoover continued to run the Willow Creek Ranch until his death in 1952. The Volk family took over the operation after that. On the day of Sam’s death in 1942, the Willow Creek Ranch had 464 purebred Herefords (valued at $155 each). Little over a decade later, there were no Herefords on the ranch. The cattle market had changed; Black Angus was trending upward. (In 1957, there were an estimated 23,000 Hereford calves in Montana. Fifty years later, there were only 3,000.) To this day, the Volks raise Black Angus on the Willow Creek Ranch and serve Black Angus at the Willow Creek Steak House in their Great Falls hotel, the Best Western Plus Heritage Inn. The Willow Creek’s breed may be different but the values remain the same. The Volks have been good stewards of Sam Stephenson’s land and legacy. Many have been the curators of Sam’s legacy. The Willow Creek Ranch and the CM Russell Museum evoke his memory from time to time. The imprint of his life and deeds can be found throughout the region. As of yet, no one has published Sam’s biography, solidifying his historical significance in Montana. His grandson, John Stephenson-Love, means to change that. For years, John has compiled family records, newspaper clippings, various documents, and interviews to write his book, Going to Highwood. The book chronicles his grandfather’s life, Willow Creek Ranch, and other tales from the Highwood Mountains, often with John’s perspective on the matter. Right now the finishing touches are being put on Going to Highwood; it will soon be available for purchase. As John memorializes his family in writing, Neal Korell preserves the Stephensons’ legacy in wood and stone. Neal is a contractor and owner of Korell Design & Construction Management. For years, his family and John’s have been close, and since 2015, he has led the project to restore Sam Stephenson’s homestead, the Hoover cabin, and two other cabins on the property. John showed Neal the 1901 homestead, Hoover’s cabin, and the sleeping cabin alongside it. The forest had begun to reclaim all three. Vandals and critters had made a mess of them. Even getting to the cabins was a challenge. The two foot bridges that crossed the creek had washed out years ago. So, John hired Neal to rebuild them. A deck led to bridges. And bridges led to a full scale restoration project. Taking care to maintain as much of the original cabins as possible, Neal, Dave Spagnlo, and other crew began work on the years-long renovation. Garbage and debris had to be removed. Roofing was replaced. The cabins needed new interiors, new electrical, new lighting, and new plumbing, along with a new outhouse. Throughout the restoration, Neal found and saved a number of treasures. A board with Sam Stephenson’s initials etched into it was used to build a kindling box. Neal gifted this to John one Christmas. Another time, a strange green cylinder was found. It was 22 inches tall and eleven inches in diameter, with unusual valves on the bottom. Neal had no idea what it was, but it was interesting, so he kept it. Six months later, a neighbor driving by spotted the object sitting outside Neal’s shop. He identified it as a water ram, a gravity-fed water pump that was used prior to WWII to push water uphill. Neal researched the device and installed it at Willow Creek to feed water forty feet uphill to the cabins. This was the first time they’d had running water. Modernization of the property was most often done in a way that enhanced the cabins’ rustic charm. While reroofing the Hoover sleeping cabin, for instance, Neal incorporated a pyramid-shaped skylight, allowing natural sunlight and the majesty of the forest to pour in overhead. Custom doors and light fixtures were installed, as was a vanity cabinet built from reclaimed wood on site. Interestingly, the sleeping cabin was the only one that John had not planned to restore. It was in the worst shape of the four, and required a significant amount of reconstruction. John needed some convincing to save it. “I took my drawings of the cabin and emailed them to Dad,” says Neal. His father, Phil, a professional oil and watercolor painter, adapted the sketches into a simple, yet moving image: a father and son with fishing poles, hands clasped in front of the refurbished sleeping cabin. This image reflected his motives for the property’s restoration. He wanted people to continue making memories there. Today, anyone can stay at the Willow Creek Cabins, with reservations made through Arrowpeak Lodge. The Stephenson homestead, Hoover cabin, and sleeping cabin are all available to rent. (The Smith Creek cabin is still privately used by the Stephensons.) Friends and family can enjoy beautiful views and fresh air in the Highwood Mountains, and go to bed in a magnificent cabin steeped in Montana history. It’s been 126 years since Sam Stephenson came to the Treasure State, yet more than a century later, he continues to enrich Montanans’ lives. Every day, people enjoy art that he owned. They eat beef produced on the ranch he established. They sleep in the cabins that he, his friends, and family built. His name might not appear in history books, and statues may never be sculpted in his honor, but his life has impacted Montana for the better. It’s the kind of life we should all hope to lead.